Seal Team Six the Raid on Osama Bin Laden Review The production values are pretty good for a Television movie and the film is entertaining enough, but if National Geographic had focused on the factual elements rather than attempting to add extra dimension to an already gripping story, it could have been something so much better. It is a curious trend in the film industry that almost every year there will be two films with strikingly similar premises competing for your hard earned dollars. Previous examples have included Dante’s Peak VS Volcano, Armageddon VS Deep Impact and, erm, Transformers VS Transmorphers. This year it’s the story of the death of Bin Laden that’s taking centre stage. 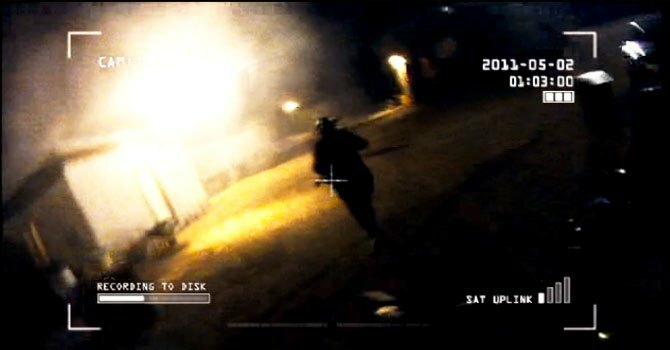 Competing film Zero Dark Thirty has garnered numerous critical accolades and both positive and negative publicity; by comparison Seal Team Six: The Raid on Osama Bin Laden has flown under the radar, receiving very little publicity at all outside of its initial television premiere. But to compare the two films would be doing each a disservice as they’re both extremely different takes on the same story, each with their own beneficial and detrimental aspects. 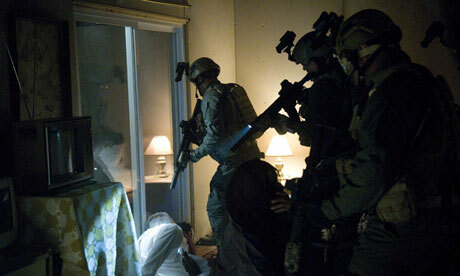 So, how does Seal Team Six: The Raid on Osama Bin Laden hold up when judged on its own merits? If there is a monumental world event, particularly if it involves America, then you can rest assured that within a few years there will be a glut of films depicting the event and dripping in patriotism. Since Bin Laden’s death there have been no fewer than three books and two films released regarding the raid on the Abbottabad compound and no doubt there are more to come. 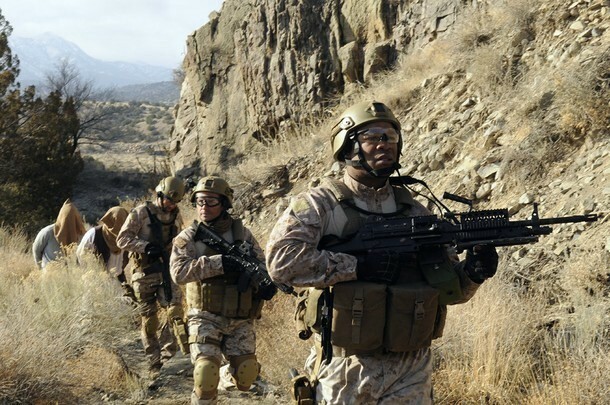 First to be released was the National Geographic Channel’s Seal Team Six: The Hunt for Osama Bin Laden, helmed by director John Stockwell (Blue Crush) and featuring Xzibit, Cam Gigandet and Eddie Kaye Thomas, perhaps most recognisable as Finch from American Pie. Detailing the lead up to and the raid itself, the film finds itself in the unenviable position of packaging a story that is familiar to most in a way that is still engaging for 90 minutes. Seal Team Six attempts to integrate facts with fiction to make an exciting experience for the viewer but in most respects it falls short. 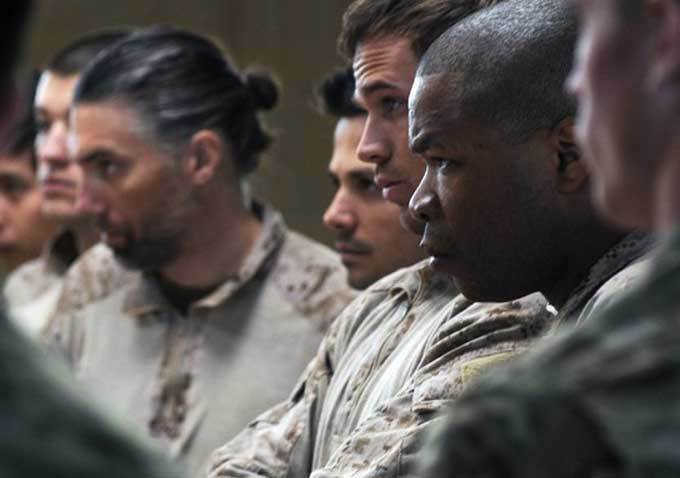 The attempts at characterisation of the members of the SEAL team is sloppily handled, resorting to clichés such as internal power struggles to pad out the running time. Bafflingly for a National Geographic production, a channel that prides itself on providing factual information about a myriad of subjects, the films eschews accuracy for the previously mentioned conflicts between fictional characters and dramatisation of events. This is most noticeable during the raid itself, which plays out much like your archetypical noisy action movie shoot out. The story of the raid itself is interesting enough and briskly paced and when the films works it’s a competently helmed depiction of the procedural elements, Intel gathering and intense training that led up to the raid itself. Unfortunately this momentum is constantly halted by the ham-fisted melodramatic moments peppered throughout. The films works best when it focuses on the actions of the team rather than the team itself; tangible suspense is built in scenes such as the residents of the compound waking to the sound of incoming choppers. Stockwell handles the action sequences with a deft hand, with the only shortcomings arising due to budgetary constraints rather than ability. Unfortunately the same cannot be said of the slower CIA scenes and faux interviews throughout. Strangely, the image quality fluctuates from scene to scene; certain scenes evoke the glossy sheen usually associated with premium television productions, whereas others have a gritty, almost handheld quality to them. This creates a bit of a visual disconnect, as the elements don’t really come together to form a cohesive whole. The film rarely delivers an image that highlights textures and minute details; despite the 1080p transfer, the image quality only occasionally measures up to the expected standard. Blacks are extremely thick, constantly threatening to smother the image, especially during the raid sequences. The daytime training and scenes featuring the CIA present the best image quality, with even colour and contrast and fine detail easily visible. Sound is competently presented in 5.1 DTS-HD, with clear delineation between dialogue, score and incidental effects; even during intense shoot outs you can hear every word of dialogue as clear as day. The supplemental features on this release are rather light, with only an 18 minute behind the scenes featurette and the original cut of the film included. The featurette deals predominately with the technical aspects of the production, interspersed with interviews with director John Stockwell and other cast and crew members. Also included is an alternate cut of the film that inserts ten minutes of excised scenes; the added footage doesn’t really add an extra dimension to the proceedings and it’s clear why some were cut, but it’s a nice feature and despite the superfluous nature of some of the scenes, I personally prefer the extended version. 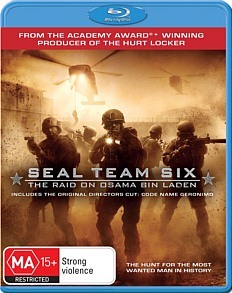 As it is, Seal Team Six: The Raid on Osama Bin Laden is an interesting little film with some decent performances that rise above its made-for-TV origins but it’s occasionally hamstrung by some misguided attempts to make the SEALS relatable. In a story such as this, the SEALS themselves are second to their actions; most people want to see the intense training and implementation of these techniques, not some random dude chatting on Skype to his family. The production values are pretty good for a Television movie and the film is entertaining enough, but if National Geographic had focused on the factual elements rather than attempting to add extra dimension to an already gripping story, it could have been something so much better.